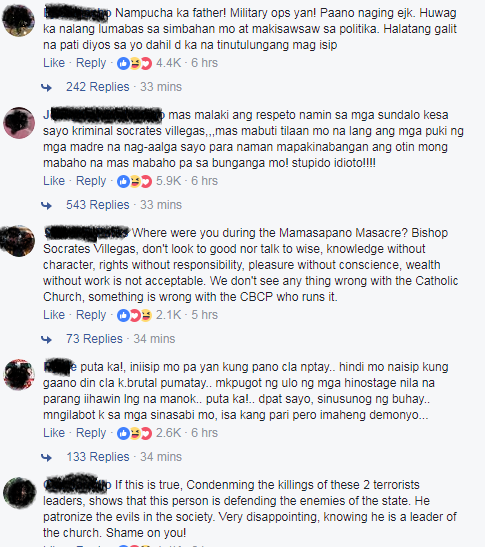 You may have come across a viral post on Facebook claiming that Archbishop Socrates Villegas has condemned the brutal killing of Omar Maute and Isnilon Hapilon. Villegas is the President of the Catholic Bishops' Conference of the Philippines (CBCP). According to the viral post, Villegas condemned the killing of the two terrorists and that he uttered the following: "Sana man lang binigyan nila ng konting respeto yong bangkay ng tao. Binaril e sa ulo pa, pwede namang sa katawan para ma-minimize ang damage." Villegas never uttered such a thing. The story is fake. Unbelievable as it is, thousands of Filipinos seemed to have fallen to the phony story. As of this writing, the post has 32,000 comments and nearly 30,000 shares on Facebook. The fake story was posted by a Facebook page called "Rodrigo Duterte Supporters" [URL: https://www.facebook.com/DU30support/]. The page has more than one million followers. "The Catholic Bishop Conference of the Philippines (CBCP), through its president, Archbishop Socrates Villegas, condemns the “brutal killing” of the leaders of ISIS-linked Maute group. On Monday, Colonel Edgard Arevalo, public information chief of the Armed Forces of the Philippines, said they received field reports that the two local terror leaders, Omar Maute and Isnilon Hapilon, are dead. “May natanggap akong mga reports pero hindi ko pwedeng i-announce. Hindi ko makumpirma but may impormasyon na. I’m not at liberty to announce it,” he told reporters at a news forum at Kamuning Bakery Cafe. Radio dzBB’s Benjie Liwanag reported that two sources confirmed the information to him. Hapilon and Omar Maute, according to the TV report, were killed inside a building beside the Binidayan dock in Lanao del Sur. The bodies of the two are now at a military headquarters to undergo DNA tests, along with other members of the Maute group killed during the operation. During a Pastoral meeting later on Monday, Villegas said the photos of the killed leaders should not have been shown to public especially that of Omar Maute, whose head was blown-out by sniper rifle. “Sana man lang binigyan nila ng konting respeto yong bangkay ng tao. Binaril e sa ulo pa, pwede namang sa katawan para ma-minimize ang damage”, Villegas said. Villegas also added that the brutal killing of the two maute members is a solid evidence that EJK is alive inside the country. “Dinedeny ng Presidente natin na walang EJK, pero itong nagyari sa dalawang kap[atid nating muslim, ito ang pinakamatibay na ebidensya na walang awing pumapatay ng tao ang mga alagad ng gobyerno”, Villegas added. The radio report said the confirmation of Hapilon and Maute’s deaths may have already reached President Rodrigo Duterte. Malacañang and Defense officials, however, have yet to issue any statement on the matter. 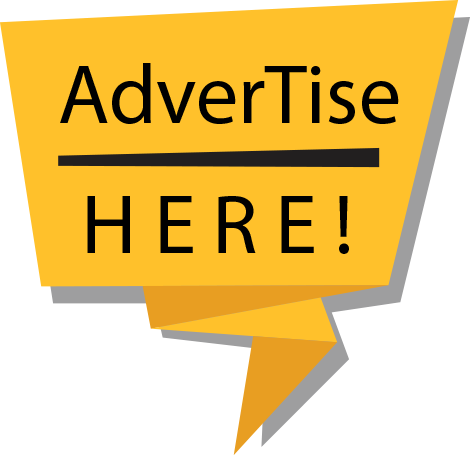 /Joy Valle/"
"Once more, CBCP is the hapless victim of fake news. Going viral on social media is a "report" that the CBCP regrets the killing of Messrs. Hapilon and Maute. The CBCP never made such a statement. On the contrary we laud the gallantry of our soldiers and their heroic efforts to free Marawi. We will gladly join government in rebuilding the city in the measure we are able. We pray for all the dead, and for lasting peace in Mindanao. 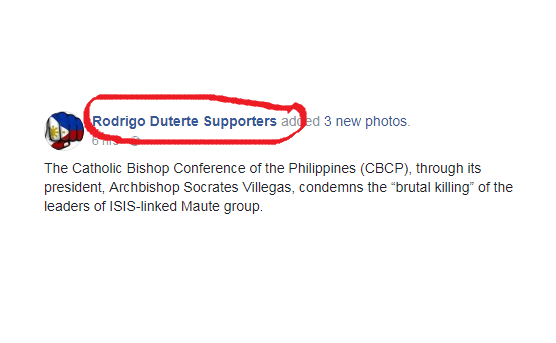 + SOCRATES B. VILLEGAS President, CBCP"